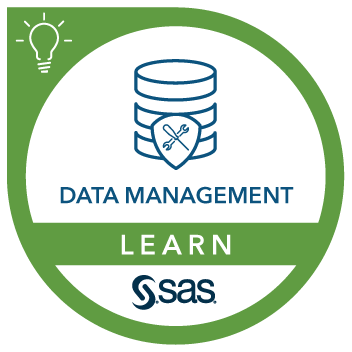 This course is a five-day boot camp that covers the content of both SAS® Data Integration Studio: Essentials and SAS® Data Integration Studio: Additional Topics. It introduces and expands the knowledge of SAS Data Integration Studio and includes topics for registering sources and targets; creating and working with jobs; and working with transformations. This course also provides information about working with slowly changing dimensions, working with the Loop transformations, and defining new transformations. Work with a variety of transformations. Establish checkpoints in a job flow. You can gain this experience by completing the SAS® Programming 1: Essentials, SAS® SQL 1: Essentials, and SAS® Macro Language 1: Essentials courses. Reviewing the course data and course tasks. Using SAS Data Integration Studio. Importing metadata for target data. Using the SQL join transformation. Working with propagation and mappings. Working with the extract transformation. Working with summary statistics transformations. Exploring status handling for transformations and jobs. Working with the data validation transformation. Working with the sort transformation. Working with the append transformation. Working with the transpose transformation. Working with the apply lookup standardization transformation. Iterating a job with Loop transformations. Iterating a single transformation with Loop transformations. Basics of the Table Loader transformation. Load styles of the Table Loader transformation. Table properties and load techniques of the Table Loader transformation. Using the Conditional Execution transformation. Creating a version of a metadata object.